I went to a meeting the other day. It was a meeting of minds. There were some extraordinary minds in the room and I have to admit that I developed a case of imposter syndrome that kept my usual disregard for the rules of engagement in check. Reflecting on the meeting, the agenda and the recorded notes (along with several other meetings of late), I find myself wondering about the meeting and team building process. The reason for this particular meeting was to bring together a group of people who were interested in research and program development in a specific area. That area being to “help” a group of folks that traditionally struggle with education and training; the multi-barriered, the difficult to engage; those in recovery; the round peg people who don’t fit into the square peg classroom. The other criterion, for invitation to this meeting, was an investment in creativity, working outside the box. It’s this second part that I’m reflecting on. It’s this second part that won’t leave me alone, it’s bugging me, irritating the inside of my skull and I know from experience that the irritation will not stop until I fully explore it and find some kind of solution at best, closure at worst. So here goes. The meeting started pretty much like all meetings. After a bit of shuffling rooms we each introduced ourselves, in the usual meeting type way of reciting our business cards. This was an initial meeting so we spent most of our time very respectfully trying to articulate our purpose. I had a great, unshared, epiphany during this time. There are educators that do not Twitter, Facebook or wiki. I had managed to remain blissfully blind to that. It was a rude awakening. If we want to do something creative, outside the box, innovative and un-traditional I am doubtful that sitting in a traditional meeting room, have a traditional meeting and following a traditional meeting script is going to move us toward that vision. There are too many mental models that get set to auto- play mode when we enter any kind of traditional space. It’s like we are all actors on a stage with a pre-defined script (nods to Shakespeare). If we are to do something different we need to stage it differently. To get people thinking outside the box you have to take the box away, shake them (us) up a bit so that the script they came in with gets lost or at least helps them forget their lines. Interestingly we talked about doing that at a later date by staging an un-conference that includes the folks we are trying to provide the net for. I say “net” because in a way that is exactly what we are trying to do. We want to capture these folks in a net that can gently hold them long enough to allow them to create their own nets, be it a safety net, network of support or personal learning network. For this to work well I think we need to use and model the same process. We need to have un-meetings, and by that I don’t mean we have to enter a state of complete chaos. I do think that we can look to leaders in the field of meeting and mental models for some ideas on how to do things a bit differently. Patrick Lencioni author of Death by Meeting, The Five Dysfunctions of Teams and other great guides provides some usable ideas around having great meetings and building functional teams. He provides a model of the five dysfunctions of teams that begins with trust as the foundation. The absence of trust, emotional trust, and fear of being vulnerable has to be resolved so that the fear of open conflict doesn’t stall the team’s efforts. He goes on to suggest that teams that don’t embrace unfiltered conflict risk lack of commitment. Genuine buy-in only occurs when every possible dissention is voiced and worked through. With these three foundational stones in place accountability and attention to results are more likely. Lencioni says “teams that trust one another, engage in conflict, commit to decisions, and hold one another accountable are very likely to set aside their individual needs and agendas and focus almost exclusively on what is best for the team”. In addition to the model he provides lots of exercises that can get any team to the alignment stage quickly and relatively painlessly. Alignment is a word I associate with Peter Senge. In his book The Fifth Discipline: The art and practice of the learning organization he covers a massive range of thinking and process around using systems thinking to create organizations that embrace and manifest generative learning. His focus tends toward the Vision being the guide and he includes a discussion about attitudes toward vision that makes the distinction between commitment, enrollment and compliance. On the committed person he says, “The committed person brings energy, passion, and excitement that cannot be generated by someone who is only compliant. The committed person doesn’t play by the rules of the game. He is responsible for the game. If the rules of the game stand in the way of achieving the vision, he will find ways to change the rules. A group of people truly committed to a common vision is an awesome force” (p. 205). Senge goes on the discuss alignment saying that alignment is the “necessary condition before empowering the individual will empower the whole team” (p.218). The easiest way to understand what he means by alignment is to think of great jazz musicians or winning basketball teams. There is a state of flow or a “groove” that happens on occasion that exemplifies true alignment. With jazz musicians and basketball players there is a set of skills that they need to master before they, as a group, can find flow. The same can be said about other kinds of teams. The skills of inquiry and reflection can go a long way in exposing our own internal maps. However it’s usually through dialogue and discussion with others, ideally with those who are also skilled in these areas, that our hidden and often self and team-limiting mental maps can be more fully examined. To do this kind of work however begins with a team that has built the necessary foundation of trust, so they can embrace open conflict… and we’re back to Lencioni again. 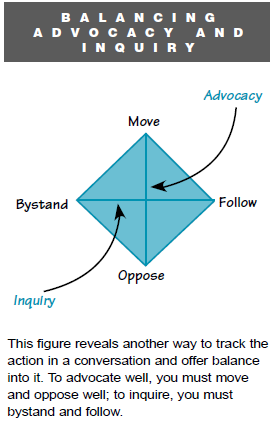 By integrating the concepts of inquiry and advocacy to the 4-player model you get a fuller picture of the route to effective dialogue and discussion that can keep teams moving in the direction they want to go. This is turning into a very long blog and I haven't even gotten to bio-teams and community as curriculum so I think I will end this here and continue in the next blog. Reaching out to the hard-to-reach can be worthy, but can also lead to unintended consequences - eg I know a drugs service that prioritises people for whom Engish is a second language, meaning that very vulnerable British people get pushed down the list. I hear you on that. Not sure how to manage it other than trying to anticipate the possible unintended consequences.